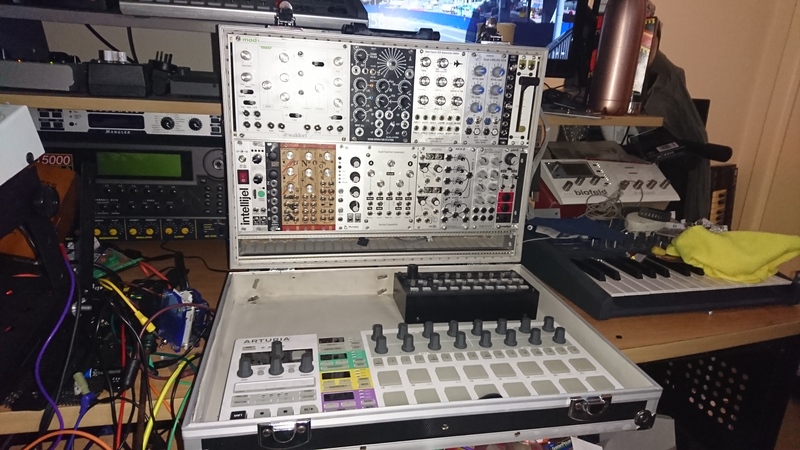 Here is my problem, if I get yet another rack mod, I will need to purchase yet another MIDI merger, like another MIDI Solutions and daisy chain it. What are you using? Thank you mark for the you spent on educating me on MIDI mergers. Here is my intended use of rack modules: I record or use one or 2 rack mods at one time. I then use the Tascam DP32sd 32-track Portastudio for direct record when not using Reaper. I also have the Soundcraft Signature USB 22 channel mixer. I am not wanting to spend $300.00 for the iConnectivity mio10 if possible. Here is a question, say I did move over to the iConnectivity mio 10, I would have to get rid of the MIDI Solutions 8 Input? Look for a Digital Music Corporation MX-8. No longer made, they were like the Swiss Army Knife of MIDI Patch Bays. You could merge, send any input to any output, MIDI FILTER, send patch changes to synths: Just about anything you wanted to do. Also very easy to program. SHHHH, I need mine first! I have an alert set on eBay but recently the asking price for the ones appearing has been just that little too high for me. Considering the only things they do that an iConnectivity box can't do is MIDI delay and MIDI compression (which I'm fairly sure can be achieved on my MIO4 by setting velocity rules), I'm not gonna pay more than 150usd for one. Oh yeah and frontface programming. I've also noticed that the sellers with good prices don't want to sell them outside of the USA. I only see their listings if I use the .com site and then I get the "seller does not ship to your country" message. Rather annoying that is. But oh well. At least they are around, unlike the Mondovox. Nobody who bought one of them will ever sell it seems and Future Retro aren't in the habit of doing reissues. More than makes up for the difference. They're good - I have MOTU micro express - but the problem is you need a computer to set up the various routings and merges. Something on the fly is not possible unless you cart at least a laptop along with you. They do have presets that you can swap between live don't they?